Macanudo Gold Label Hampton Court brings you ultra-smooth Dominican flavor in a 5 3/4 x 43 Corona Extra vitola. Macanudo's are always great and this cigar is probably a fav of mine. Macanudo Gold Label Hampton Court is rated 5 out of 5 based on 2 customer ratings. That's right--make sure to grab them while we have them in, because they go quickly! Are Macanudos gold labels cigars only produced around June or do they produce them year round? 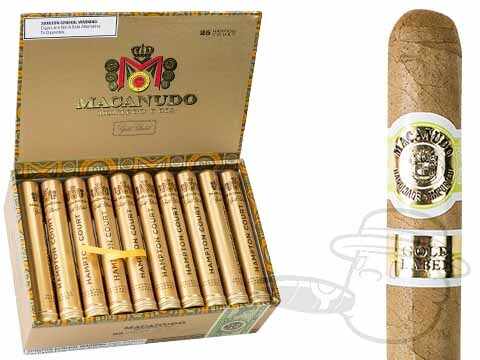 The Macanudo Gold Label cigars are, in fact, only produced in June. They do this for several reasons but it'd be a good idea to grab a box quick when they are in, because they go quickly! Once they're gone, you won't see them for another year.